I attended my grandchildren’s Christmas play this morning. When they appeared on stage the mum, dad and myself had to wave until the two boys caught our gaze. They were ready to get on with the show knowing family were watching. It doesn’t seem so long ago since I was watching each of my own boys and girls in a traditional Christmas play. They would dress up as a shepherd, an angel, a wise King or a donkey. They sang songs about Jesus birth. Today’s event was different. The children invited us to see how six other nations celebrate Christmas. Poland and China were my favourites. The little ones were dressed in red Chinese costumes and flat hats. I must congratulate the teachers on managing so many young students. A big effort indeed. I called my son last night to tell him I wouldn’t be able to make it. I was too far away, too cold, too sore, too old, too tired, too alone and my car wasn’t working. I awoke early. I changed my mind and made the effort to go. Ressurrection power kicked in. The electric plugs had fused. First hurdle to overcome. I dressed in warm clothes because the chilly cold winter winds were blowing. I got the ferry. It was navigating across from Portaferry to Strangford on choppy waters. I sat nervous in my van. I hoped the wind would die down for my return journey. All the effort was worth it to see my son’s and grandchildren’s smiley faces because granny came along. I remember being at a school event after my first grandchild was born. Everyone was congratulating me on being a granny. It must be an important hurdle for a woman. We now have eighteen grandchildren. Most of them live too far away to attend school plays. They live in far flung places; Canada, Slovakia and Dublin. I’m glad I didn’t miss today’s Christmas show. The Air Transat plane had a bumpy landing into Calgary. This city on the Canadian prairie presents a challenge to any pilot. Winds from the Rockies circulate over the area. I had been traveling for eight hours. I held my neighbor’s hand. She was frightened. The tension eased and many passengers disembarked. The rest of us were continuing our journey onto Vancouver. I had a toothache over the previous weekend. It was bank holiday Monday so my dentist was not available. I needed attention as I was leaving for Vancouver on Tuesday. I got some penicillin and pain relief from an emergency dentist at the City hospital. I thought that will sort my condition till I get back in a week’s time. The toothache did not ease on the journey. I doubled the dose of medication. My head was so sore I couldn’t enjoy any movies or music offered. I dozed on and off. I comforted a lady beside me who was traveling on her own. When the flight landed in Calgary I rushed to the bathroom. I was feeling sick. Why did I not stay at home. This long journey is all too much. Why did my son have to get married in Canada so far away from home. Too much a sacrifice. I will make my body a living sacrifice despite the pain. This is true worship to God. I have suffered other pain over the past two years. I have had heartache. My husband and I had travelled to Vancouver many times over the past ten years, speaking about the love of God to many people. Canadian friends have visited Ireland. I encouraged the connection between ourselves and Canada because of a dream. This dream has tested my heart over the past two years. My son David moved to live in Toronto two years ago. He and Jacquelyn have a baby girl. I now have a Candian grandchild! The Irish/Canada dream connection was strengthened. I have visited them in Toronto. It is not too far to travel from Ireland. There are good flight connections out of Dubin. When Isaac finished his studies two years ago he too left for Canada. He had spent some time in an internship as part of his degree. I thought he was going to visit friends there and would return after a few months. He has been working in Vancouver ever since. He developed a relationship with a Canadian girl. Will I see him again? Vancouver is 7000 Kilometres away across the ocean and continent, the end of the earth! I thought back to Irish mothers whose sons left for America down through the decades because of circumstances, famine, hardship or war. Many left N Ireland during the recent troubles in the seventies. These mothers made sacrifices to let their sons leave and give them an opportunity of a better life. Many did not see their children again. As a mother I have a choice. I can nurture the grief and mourn over my two sons who live far away. I may not see my grand children growing up. I can remain sad. I don’t want to internalize my pain and develop some sickness as a result of my depressed situation. That’s what happened when I had cancer. God has healed me of fourth stage cancer and saved me from dying six years ago. I don’t want to get sick again. I choose not to internalize my heartache. I cast my pain upon Jesus. Jesus became a Sacrifice on the Cross when he shed his blood and died. He took all my suffering and pain. I share in his suffering as I experience the pain in my heart of my children leaving home. I will not deny the pain and say I am alright. I have gone through the valley of loneliness and sadness. I will offer up this pain of toothache and heartache as a sacrifice. Jesus mother Mary watched as her son was cruelly killed. Her heart was pierced. Jesus spoke to the women as he carried his cross to Calvery. He knew that women would suffer in child bearing and rearing. I awaken in the night with Jetlag. I hear a train’s horn blowing. The sound gets stronger as it passes nearby. It is a familiar sound from my visits to Canada in the past. At day break I hear new sounds. Chuck chuck, whistle whistle, chirrup, chirrup, the sounds of a dawn chorus. These sounds speak to me to welcome me to this different country before anyone else is up. We have been hosted in a beautiful home in the woodland. We have attended barbecues, breakfasts and been well received in Vancouver. The wedding day has arrived. The bride and bridesmaids are excited. They are getting ready. The bridegroom, our son, has found his bride. Jesus has healed me. My toothache has gone. My heart is healed. By the stripes of Jesus I am healed. Isaiah 53. Tomorrow is Mother’s Day in Canada. I will celebrate the day in victory grateful to have lived to see another of my children married and setting off and released into his new future. Family Friday. Grandchildren are the Crown and Glory of the Aged. Last Saturday I attended a family event. About one hundred and fifty people gathered together to celebrate being children, grandchildren and great grandchildren of my mother and father. My parents are both dead, but we met to honor their memory and their sacrifice to rear us, their ten children. It was because of their example I had endurance to have fourteen children of my own. My father was a farmer. The land produced crops and fed animals. I remember my father walking across a field scattering corn seed with a fiddle. He did not have the modern machinery that ploughs up the ground, prepares it for the seed and then sows the seed all in a few days. He arose early every morning to milk cows, “twenty four seven”. My mother and father shared the work. Mummy supplemented the income by rearing hens and selling the eggs. As we their children grew up we helped with the work. My parents educated all their ten children. The event last week was a focus for some of my own children to return from far away to join the celebrations. My son David called me two weeks before to tell me he was thinking of coming over from Canada to be there. It would be an occasion when he and Jacquelyn could introduce their baby daughter Ava, now eight months to his brothers and sisters and extended family. I was delighted and encouraged him to come. God blessed his plans. He was able to book flights that were affordable even at short notice and within the time frame of days he could get off work. I met them at Dublin airport. One year ago exactly Brendan and I stood in Dublin airport and waved goodbye to David and Jacquelyn as they left Ireland to settle in Canada. They returned to these shores of Ireland last Thursday! It was a day of joy! They were with us for five full days. Baby Ava met and played with her cousins, got nursed and shared around to willing arms to hold her. David hung out with his brothers and sisters. Jacquelyn met up with friends. David and Jacquelyn are adjusting well to being young parents. 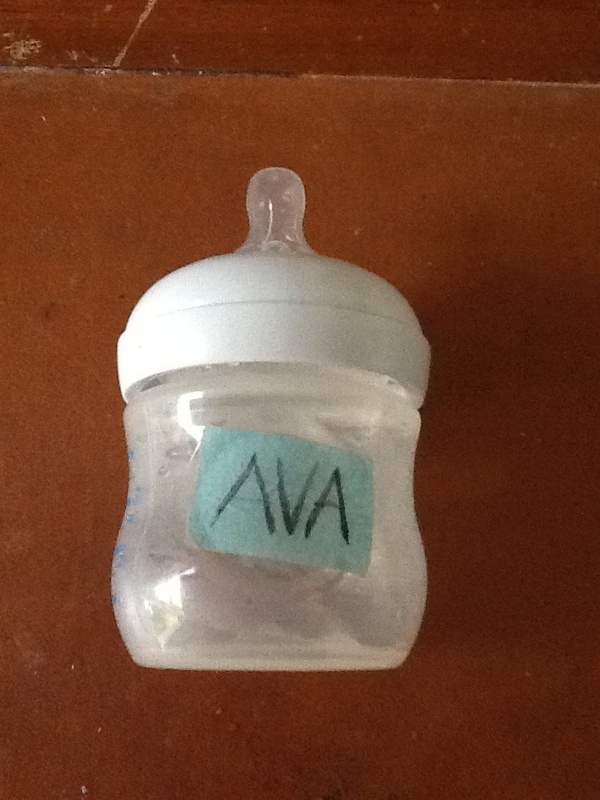 They lovingly care for Ava. . Last evening I found one of Ava’s bottles. I shed a few tears. I was missing David and his family. I miss Jacquelyn up early in the kitchen preparing bottles of milk for Ava. I miss my grandchild playing around on the floor. I miss my son David. But I have joy in knowing he is starting out in life to look after his own family. Like my father and my husband he will be an excellent provider and protector for Jacquelyn and Ava. Brendan and I got to see our grandchild Ava. We will see her again. In my blogs recently I have been talking about birds. I get inspiration from them. Jesus told us to look at the Birds. A good plug for going bird watching. I know a friend who was heart broken after her husband left her. Part of her therapy to recover was to go bird watching. She joined a local Bird Watching Club. One of my sons has finished his training in Law. He is home for the holidays. I was urging him to return to Scotland after the holidays and apply for trainee jobs to get him to the next stage. Getting a job is so competitive. In my mother role I was getting annoyed and worried. Scriptures say worry is a sin and I don’t want to sin. So I have to stop worrying and pray. After a good nights sleep my mind is changed. I have to let my son decide for himself and not con trol him. I have to let him go. I can advise but it is up to him what he does. It was by making mistakes and suffering I learned about life and the right choices to make. I cannot go back to seven years ago when I developed cancer. I have to stay alive. Part of the role of parents is to look after the children but then to let them go to start their own lives. Around the time I developed cancer, I was finding it hard to cope with the lose in my life of children leaving home. My heart was breaking. I was suffering in silence. Mother Duck and her little ones. As she finishes the rhyme she starts to cry. She must have been sad for the mother duck left alone. The internet says it is a nursery rhyme that teaches children to count backwards. That may be so but the writer of this work had something else in mind I believe. As children leave home one by one a mother feels the pain of her lose. The mother and children spend time together when the children are young. They go out to play together. Then a day comes when one grows up and has to leave to go over the hills and far away. Nowadays hills don’t just separate us . Oceans wide and deep separate us. One by one the ducks go far away. This has been so for me and my children. My last little duck left two years ago. My heart would have been broken if The Lord has not comforted me and healed me. He has given me other work to do after rearing my children. And all of the five little ducks came back. I think of a verse from the scriptures often. Don’t cry mothers out there. The Lord will reward your work. Like mother duck the young will return. When I visited my children at their Scottish universities I would buy a tartan woollen blanket each time. I now have a collection of blankets in all colours, blue, red, purple and grey. I use one as a throw over a duvet on a winter’s night. It prevents heat lose through the night. They come in useful for ground cover on a picnic or warmth for a baby playing on the floor. I use one over my settee. It is useful when one needs to stretch out and put one’s feet up for forty winks in the afternoon. Even the dog got to have one. I always tried to visit my children, each one, when they were at university. One son shared a flat with five other lads in Glasgow. When I arrived the students were sitting around a play station. They were concentrating on the game. The kitchen sink was full of dishes and the garbage tin full of cans and empty bottles. My son showed me to his room that he had prepared for me to stay. The situation did not phase me. I stepped over bodies to get to the room and rested for a while after my journey. I was so glad to be alive to visit him, after my healing from cancer. Things that would have annoyed me before, didn’t bother me. I could have been in the grave and never have seen my boys on the earth again. What did a few dirty dishes matter. When I got up later everyone had gone. It seemed these boys came alive at night and kept a low profile by day. My son took me out for a meal and we spent a short time together before I moved on by train to Aberdeen to see another son. He gave up his bed for me. He showed me around the university and introduced me to some of his friends. I was relaxed enjoying my visit with him, being alive. I traveled down to London after Aberdeen. I shuddered when my son showed me his bedroom. It was freezing. The window was single glazed, the curtains were flimsy and the duvet light. The young mustn’t feel the cold. I went out and bought my son a woolen blanket. At least it will give a bit of comfort and warmth. Only mothers see the need. The blankets have become an inheritance for my children. This son still has the woollen blanket I gave him. He has brought it to his new home in Canada. I bought a tartan blanket for another son when he was at Oxford Brooke’s. He used it for picnics on the lawns of Oxford universities as well as a covering on his bed. He still has it and it is still in use for his two boys when he takes his family on picnics. I was talking to him recently. He was staying in my home while we were away. He appreciated the woollen blankets I had beside the sofa. He enjoyed a few siestas with a woollen blanket pulled up over him. A thought dropped into his mind, “I wonder could I make a wrap around out of a woollen blanket.” There is a special warmth that comes from a woollen garment. He was delighted later that day to find a pure woollen dressing gown in a thrift store for a few pounds. He will have no fear of the cold winter evenings. I suppose it is a mother’s instinct to make sure her children are comfortable. When my children were babies I always made sure they were tucked up warmly in bed. They slept better that way. The scriptures make reference to this in Isaiah 66, where God promises to comfort us.